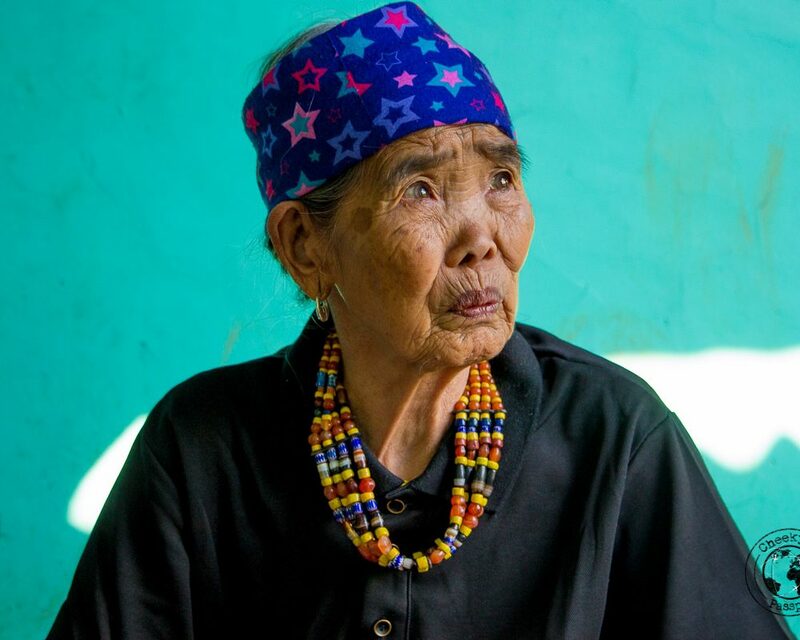 Buscalan, The Philippines, the village of fierce (former) head-hunters, is today famous for being home to Whang-Od, the 100-year old, world-renowned tattoo artist who continues to ink enthusiastic visitors looking for a Filipino tribal tattoo, using the traditional Kalinga tribe backhand tap technique. In fact, this is the reason why we found ourselves in Buscalan, the Philippines. 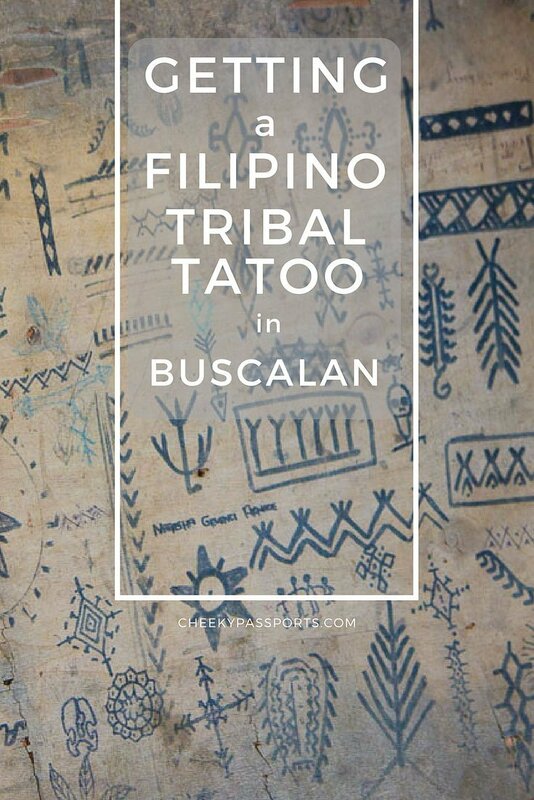 I wanted to get a Filipino tribal tattoo by Whang-Od and planned our itinerary to include Buscalan village accordingly. The Butbut tribe to which Whang-Od belongs is an indigenous Kalinga tribe (one of many) in the Philippines’ Cordillera region. The Kalinga tribes are generally associated with head-hunting, although this practice died out in the 1960’s. 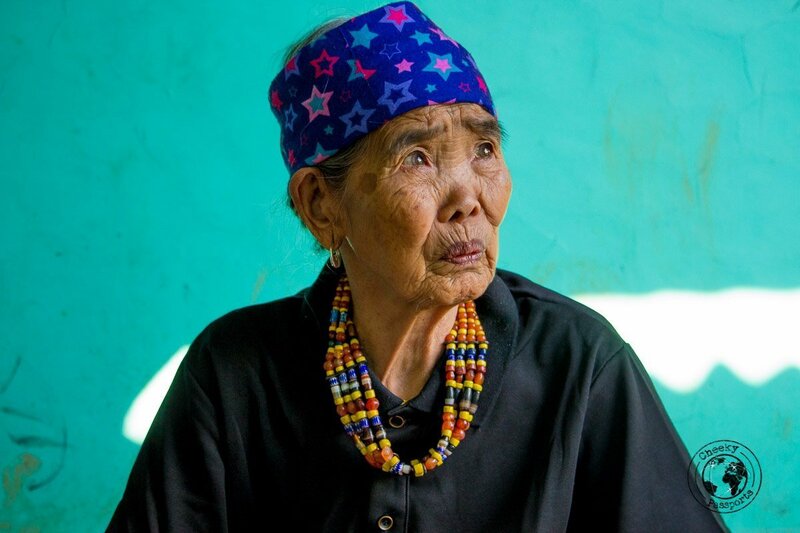 Not much is known about Kalinga people since historically, they remained rather isolated, having little interaction with the rest of the Filipino people in the lowlands. 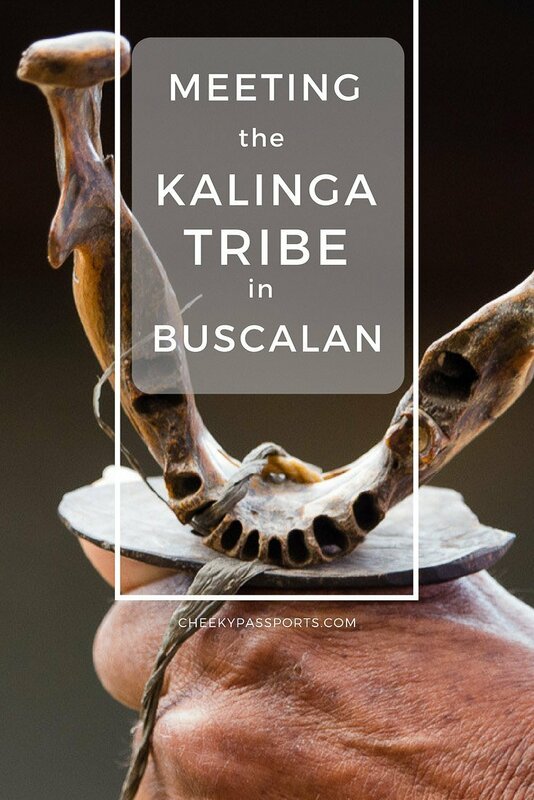 Even if you don’t plan on getting a Filipino tribal tattoo, experiencing Buscalan and meeting locals from the ButBut Kalinga tribe is one of the most fascinating experiences you can have in the Philippines. 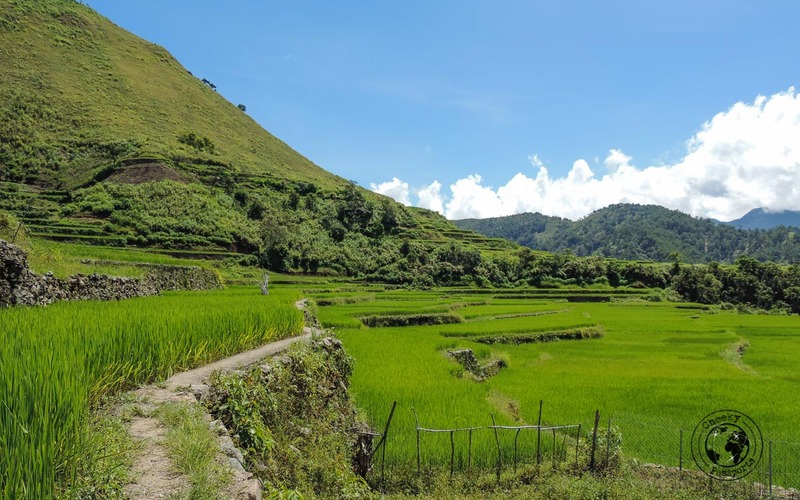 Buscalan village, located in the Kalinga province right in the heart of the mountains amidst lush rice terraces and waterfalls, is as gorgeous as a mountain village can be. 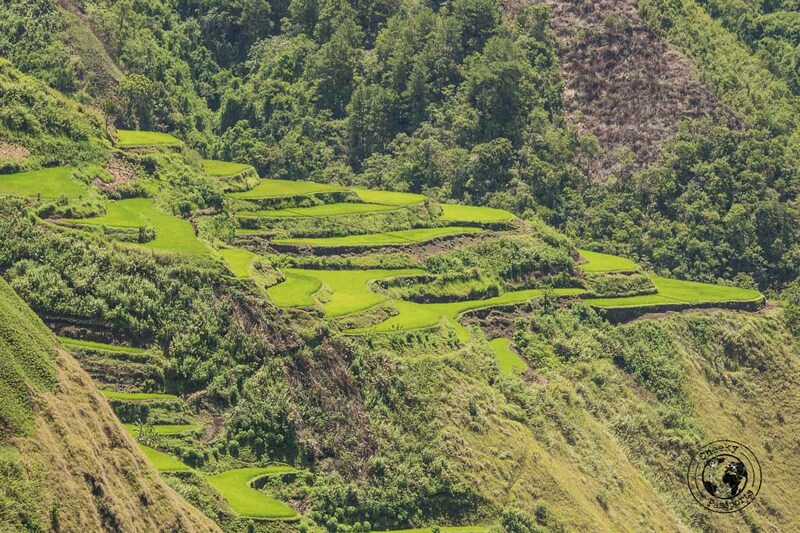 The views from Buscalan are some of the most beautiful we have seen in rural Philippines! We just couldn’t stop taking photos of the beautiful rice terraces surrounding the village! Detailed information about contacting a guide (required) and getting from Bontoc to Buscalan are included in a separate post. Whether you are in Buscalan, the Philippines to get a Filipino tribal tattoo or to experience life in a Kalinga tribe village, the only source of accommodation (as of May 2017) is a local homestay which your guide will arrange for you at a cost of 250 PHP (€ 5) per person per day. Not all homestays are equipped with an electrical supply, so if you intend charging phones and cameras, do ask to be placed in a home with electricity. This said, despite the fact that we did request this ourselves, when we arrived in the village we were told that power had been out for the past four days and was not expected to be reinstated any time soon. Take a portable flashlight with you, this is essential! The room in the home was quite comfortable, although no blanket was provided, and it does get cold at night! The toilet was outside, in a little shed a few metres away from the house, and during the time we spent there, we never really figured out how to have a shower other than filling a bucket from a tap and throwing it over our heads. This is where things became complicated. The family we were staying with were also the owners of a little shop at the ground floor of the building, best described as a tuck shop selling a few sweets, chocolates, noodles, canned tuna and eggs. There are two or three such shops in Buscalan. We had been told that our hosts would prepare meals for us during our stay, but this didn’t seem to be happening. When we got hungry and asked what food we could order (upon payment or otherwise), everyone seemed to get very confused and we were told that we could eat anything we wanted! Confused by that answer, we eventually figured out that ‘anything’ meant that rice was always available at the Kalinga tribe homestay and other ingredients to top up, could be purchased and cooked. The list of available ingredients of course was extremely limited; we just bought eggs from our hosts’ shop and cooked them in their kitchen. A couple of times we also bought pot noodles. And that was the menu for the length of our stay – rice, eggs and pot noodles for breakfast lunch and dinner. The canned tuna was not appealing at all – we had tasted it during our first week in the Philippines and resolved never to eat again. We strongly advise you to bring some food provisions such as crackers and bread from Bontoc if you cannot handle eating rice all the time. If you want to get a Filipino tribal tattoo by Whang-Od or any other tattooist in the village, be prepared to wait. We had been told that there’s usually a three to four days waiting list for Whang-Od so you would need to stay in the village for around four days. Raffi, our Kalinga tribe guide, however managed to get us an appointment the first day that we were there. Other people were not so lucky though and we are still not sure how he managed to accommodate us so easily, other than assuming that Whang-Od had a special liking to the young energetic fellow who, by the way, doubled up as a lifeguard in a coastal resort in the warmer summer months. 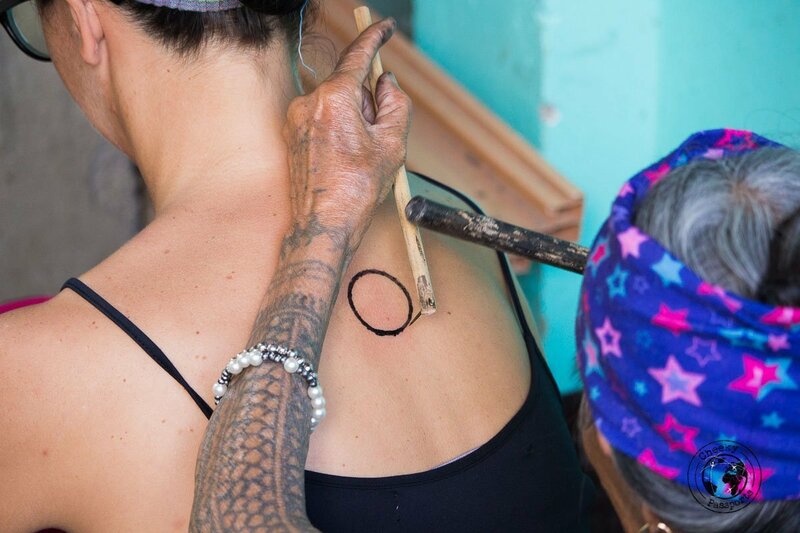 If you’re waiting to get a Filipino tribal tattoo your time will be pretty much spent wandering around the tiny village, talking to locals, and observing the tattoo artists at work. There really isn’t much else to do in Buscalan. 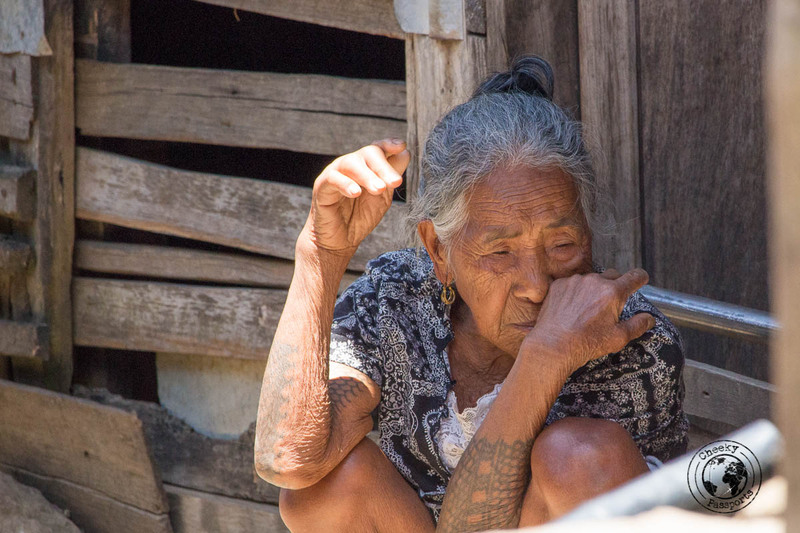 For those not getting a tattoo, you can leave the village to go hike up the steep hills around it, possibly also visit the even more remote neighbouring Kalinga tribe villages. The area is really very pretty although the hikes can be strenuous. If, on the other hand you already got a tattoo but you’re spending some more time in Buscalan, we do not advise you to hike. This because ideally, you should not get too much sweat on your fresh tattoo or spend too much time walking, especially if the tattoo is on your lower limbs. You also need to protect the Filipino tribal tattoo from sun, rain and the elements as much as possible, to give it time to start healing. 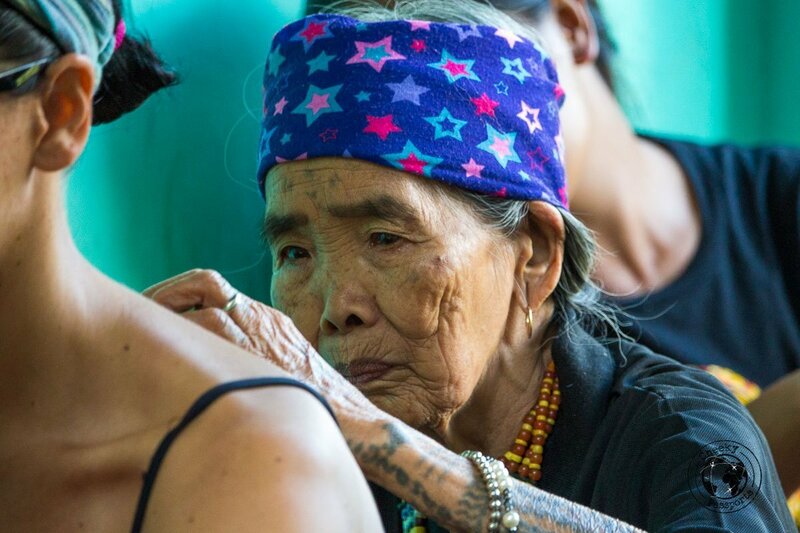 Contrary to popular perception, Whang-Od is not the only tattooist of the Butbut Kalinga tribe (although she might have been at one point) and you can get your Filipino tribal tattoo from other younger locals who have been mentored by her. In fact we observed that the younger villagers’ works were larger and more precise, whilst Whang-Od was focusing only on the uncomplicated patterns. 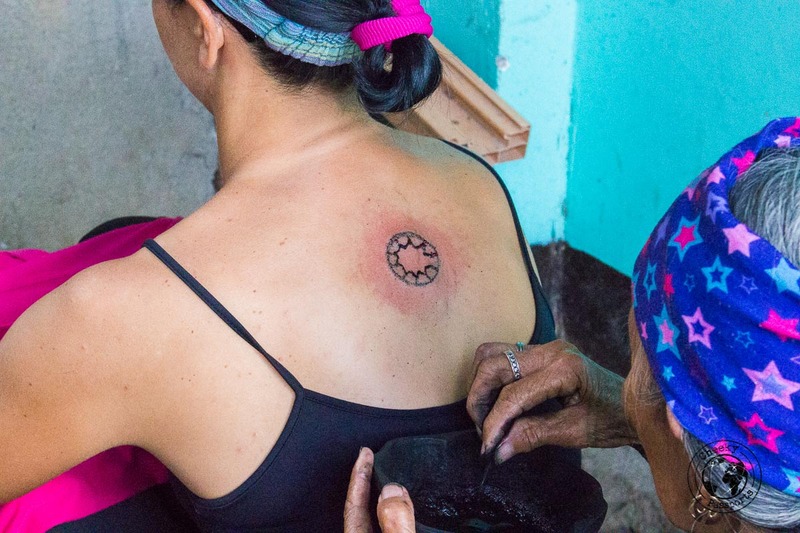 This could also be due to the fact that tourists who got their Filipino tribal tattoo from the other villagers, also passed by Whang-Od’s work area later to get her legendary signature of three black dots below their new tattoo. I was faced with the dilemma of going for a more precise tattoo from the other villagers, or compromise for a more ‘imperfect’ one, from the tattoo master Whang-Od. 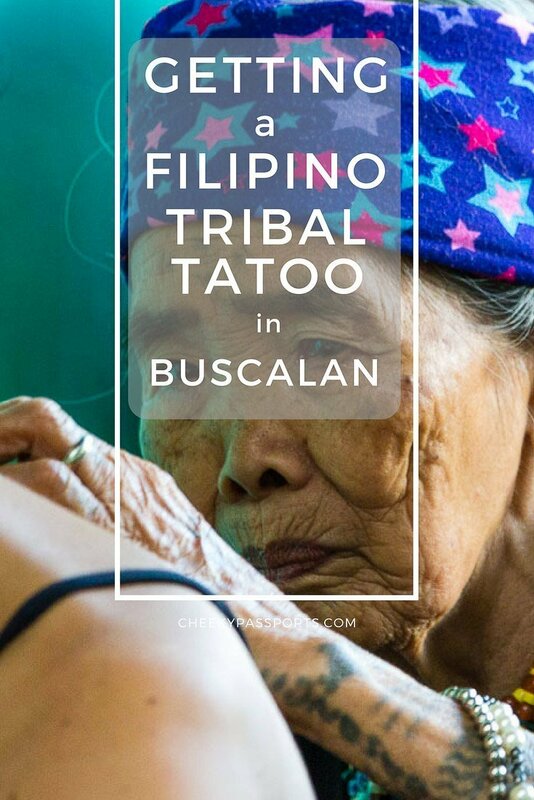 After some thought, I decided that if I came all the way up to Buscalan to see and meet Whang-Od, I wanted to get my Filipino tribal tattoo from the legend herself, especially after the guide assured me that I would not have to wait for too long. We had been informed that getting a Filipino tribal tattoo in Buscalan was not the most hygienic practise, so I was eager to take all the precautions necessary and possible to prevent infection. The tattoo is made using a sharp pomelo thorn on a stick. The ink is a mixture of charcoal and water. Before deciding to get a Filipino tribal tattoo, inform yourself of any associated health risks and make an informed decision wisely. This post is not aimed at defining or preventing health risks, but is rather, a personal account of my experience in getting a tattoo from Whang-Od. I told my guide that I definitely wanted Whang-Od to use a new, clean pomelo thorn for my tattoo, and to my relief he agreed whole-heartedly, and proceeded to present me with my own personal stick and pomelo thorn which he said I could keep as a souvenir after having the tattoo made. I was happy to see that the thorn was incredibly sharp! Raffi, the guide, told us to meet him near Whang-Od’s workspot in the late afternoon so we spent much of our afternoon walking around the village, observing and smiling at locals. After meeting Raffi, we joined a queue of people waiting to get their Filipino tribal tattoo and chatted for a while. I was told to choose my design from a piece of wood containing rough images of the possible designs. There are only a handful of ‘designs’ you can choose from. 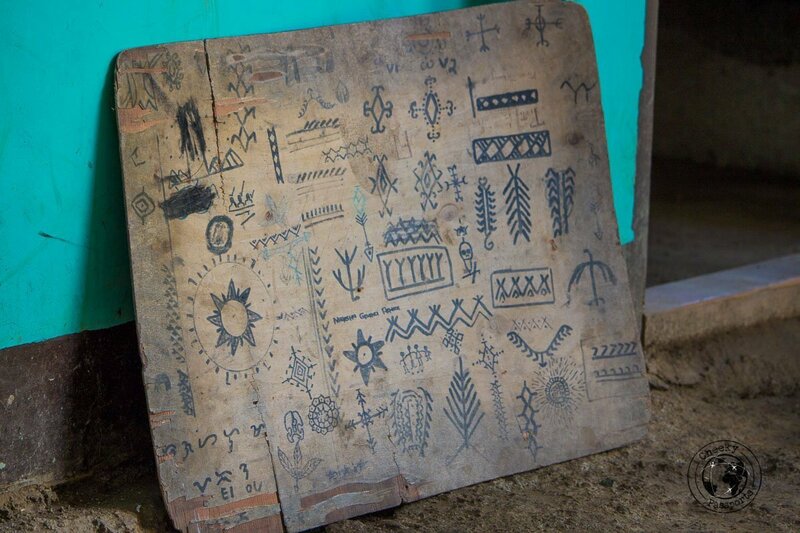 The images represent nature and tribal life with many of the designs being linear and ‘zig zag’. I decided to go for a rather large one which Raffi explained was an image of the sun and the moon and represented life. Whilst I was waiting in the queue, the other tourists told me that Whang-Od is no longer making that tattoo since it takes up too much time so I mentally chose a second one, however to my delight, she agreed on tattooing my preferred image. I chose to have the tattoo made on my back, which meant that I couldn’t watch it being made. Nikki filmed the whole experience though! Like the rest of the people waiting in line, I was wondering whether the experience would be painful. Some of the tourists seemed to be making quite a fuss about the pain. Quite frankly, it did not hurt as much as I thought it would, although I have been told that I have a high pain tolerance. This made my experience a lot more pleasant! When observing other tourists getting the tattoo, I noticed that the pomelo thorn was not being changed from one person to the next, with both locals and tourists seemingly giving little care to this detail! I told Raffi to keep insisting with Whang-Od about using only my own personal thorn and not to switch to using another one at any point. I also provided her with a large packet of wet wipes which she started using. After some time, she started dipping the same wipe in a bucket of filthy water. Unhappily, I tried insisting that she use fresh wipes instead of the water, but she just seemed to be more comfortable with the water. The tattooing process lasted close to an hour. Whang-Od does not speak English, so ask your English-speaking guide to stay besides you during the process in case you would need to communicate with her. Luckily for me, Raffi was there to guide me though the whole experience. My first instict was to use an antibiotic cream as soon as the tattoo had stopped bleeding, but I was advised by one of the locals not to use anything except fresh coconut oil which I could buy from the village. I had also read about the importance of keeping the tattoo ‘moist’ and was told that it would heal better if it took longer to dry up, hence the importance of using the oil. It was difficult to do away with the antibiotic cream and trust in the local healing practises, but I figured that the Kalinga tribe villagers were the greater authority when it came to local tattoos, seeing that they were covered in them! I was also told not to wet the tattoo or swim for four weeks, which was precisely the reason why we went to Buscalan towards the end of our trip to the Philippines. My back was sore for the next few days and a crust started to form, but happily I could see that it was not becoming infected and the redness from the trauma disappeared after a few days, as did the swelling. A white crust started to form after a week, which would have normally alarmed me, but I had been told that this was perfectly normal and presented no cause for concern. My embossed skin started to ‘sink’ after a while and ‘mini craters’ appeared in some areas, but after a few weeks, the lines evened out and my skin returned to its normal turgidity. The white crust fell off too. With the help of Nikki who became my personal carer during this period, I was very careful to apply coconut oil twice a day and keep it protected from sun and water. I did not swim for seven weeks. By the twelfth week it was perfectly healed with no issues. Note that after care detail included in this post is by no means comprehensive, and reflects only my experience in getting a Filipino tribal tattoo. Be sure to do your own research, evaluate risks and ask local people for tattoo after care advice . 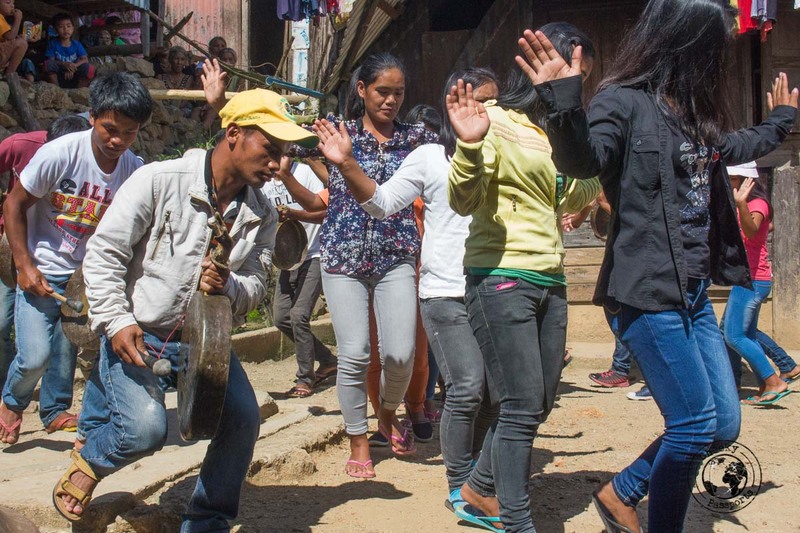 As soon as we arrived in Buscalan, we were told that that there was going to be a large party happening that weekend. I was lucky enough to get my Filipino tribal tattoo the day before the party, as all ‘normal’ activity in the Kalinga tribe village was halted on the festival day. The festival was held in honour of a villager who was celebrating his eightieth birthday. 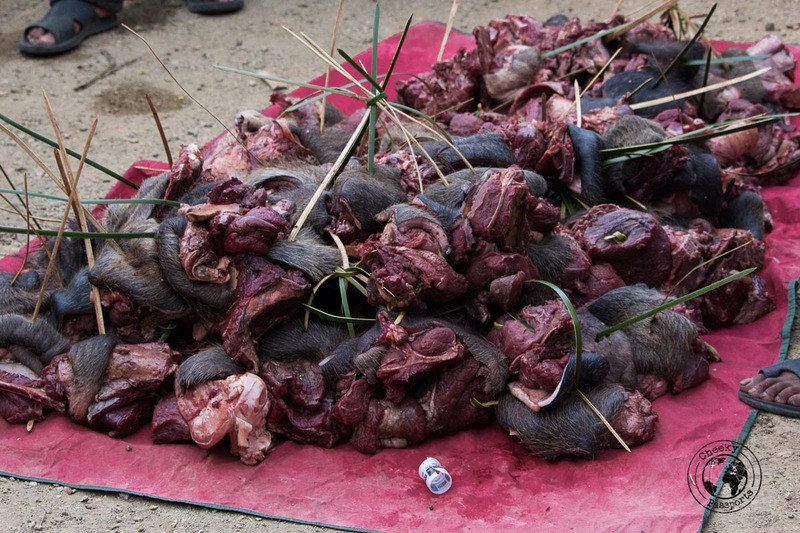 As part of the celebrations, seven carabao (bisons) were killed in his honour. The animals were donated by each of his seven children (who saved up for a long time to honour their father in this manner) and would feed the whole village after they were killed and brought up from the lowlands. 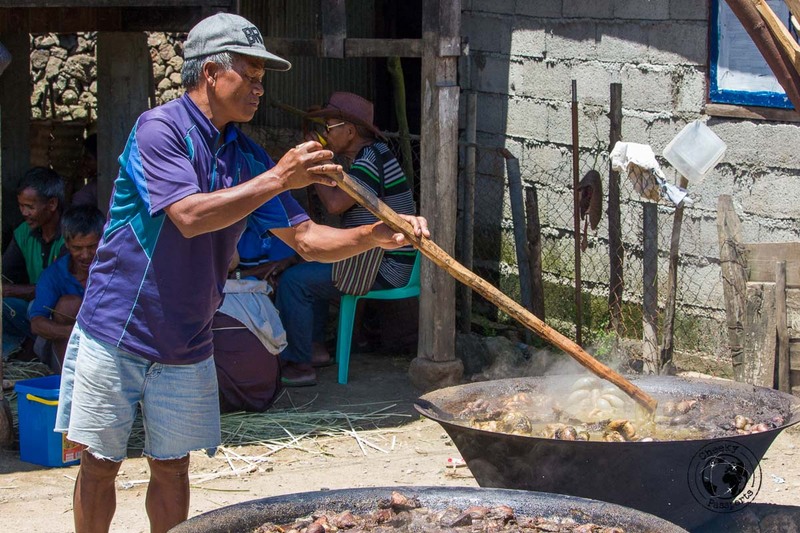 As we walked around the village that day, we could smell the strong aromas of cooked meats and we soon found the place where all the cooking activity was taking place. As we approached, we also started to smell the stench of blood whereupon we suddenly came upon a building in which several men were sorting out animal parts. Huge pots were bubbling all around the shed with what we assumed was some kind of soup. Upon a closer inspection, the pots revealed large intestines, kidneys, hearts and other organs being boiled in a brown gravy. After two days of eating rice and eggs, we have to say that the smell was not unpleasant at all, although the sight was not for the squeamish. We’re including some of the mildest photos below so that you can get the idea. At around 1pm we heard a loud gong signalling the start of the dancing. We quickly made our way to a large opening in the village where the party was being held. We had been advised to take some offerings as a sign of respect with us, so we bought some nuts and candy and gave them to the men coordinating the party, who were conveniently sitting at the table in the square collecting other gifts. We were quickly welcomed, and swiftly found a place on a little nearby ledge to watch the dancing. The locals explained that the Kalinga tribe men would be sounding the gongs whilst the women would perform a traditional dance, in which they would imitate the flight of an eagle. Very casually one of the locals pointed to the polished jaw-shaped handles on some of the older gongs which the men were carrying. “You see those? 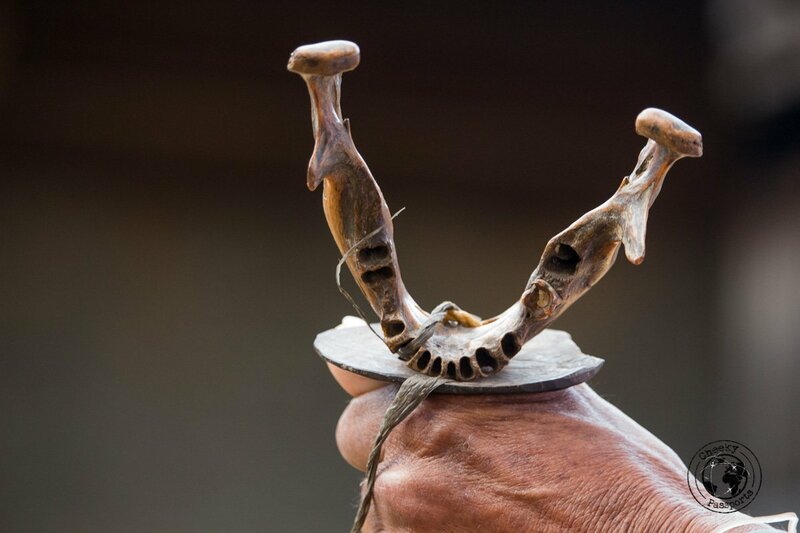 Human jaws of enemies” he eagerly told us, explaining that they were a legacy from the Kalinga’s headhunting exploits which were only terminated in the 1960’s. Although the jaws looked human they didn’t really feel human to us. In any case, I thought I would have felt a lot more horrified than I did at watching humans playing around with other human jaws, enemies or otherwise. 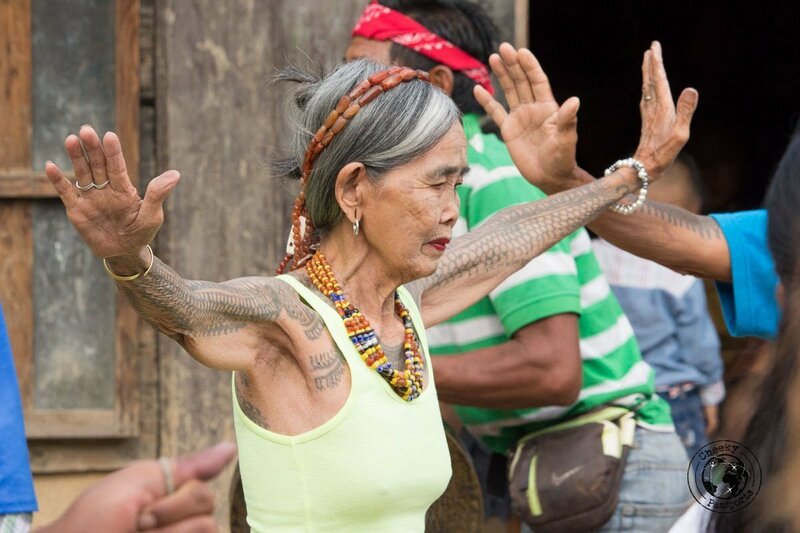 The soreness of my new Filipino tribal tattoo had left me feeling pretty exhausted and the last thing I felt like at that point was flapping my arms up and down amidst a circle of women, with all of the village laughing and clapping, whilst avoiding being hit on my freshly inked back. But that I did…. and it was ok though slightly embarrassing! Dancing during the party which eventually Nikki and I joined! To our delight, Whang-Od joined the next dance. Her hair was neatly parted and adorned with beads matching those around her neck. She was wearing a dark lipstick and silver earrings and looked absolutely stunning for a woman of her age. She danced around with ease making the same fluid movements as her fellow villagers and blended in with the dancers very smoothly. We loved watching her dance in the festival considering that she is usually portrayed as very serious. Anyway, we realised that some other activities were happening in different spots in the village – large open spaces were again filled with meat parts and the names of villagers were being read out. Big chunks of meat were being assigned to every local family. 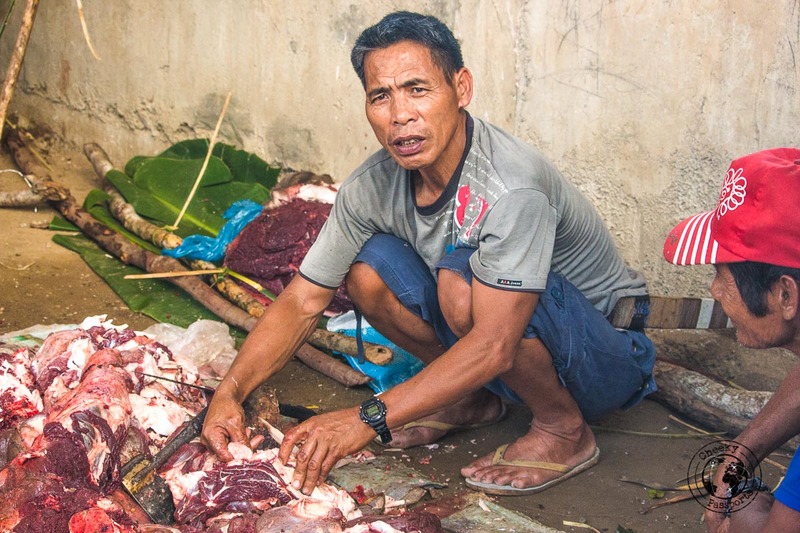 We were told that the meat chunks were gifts from people from neighbouring Kalinga tribe villages who had come to celebrate and enjoy the party taking place in Buscalan. In the meantime we were given bowls of the soup with some entrails we had seen being prepared during our morning walk. The soup was a greyish brown colour and tasted a little bitter and very strong. Bits of intestine and skin were floating around in it. We were hungry, but not too keen on consuming too much of it, yet as nothing else was available really, we swallowed it down hoping that it wouldn’t result in too many frequent toilet visits (happy to report that we slept right through the night). As the day came to an end, the villagers retired to their homes and started smoking their large chunks of meat on barbeques outside. We eyed them hungrily, but that meat wasn’t meant for immediate consumption, and would be smoked, cured and saved for special occasions. We went back to our room and devoured our last ration of salted crackers, dreaming of the large meal we planned on eating upon our return to Bontoc the following day!